LEED AP BD+C professionals must maintain 30 hours of CE (including 6 hours of LEED-specific) every 2 years. The purpose of credential maintenance is to encourage learning experiences that demonstrate continued competency and up-to-date industry knowledge. LEED AP BD+C continuing education is required for all credential holders. 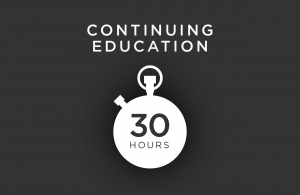 You must participate in 30 hours of education within 2 years of earning the credential. There are several types of activities that qualify: education, project experience, authorship and volunteering. Access the CMP Guide for additional information about LEED professional credential maintenance. LEED-specific is defined as an activity that has an explicit connection to a rating system. For LEED AP BD+C credential holders, LEED-specific CE hours must relate directly to the rating systems within the BD+C reference guide. All continuing education courses must be taken before your credential period expires. Fortunately, there is a slight grace period where credential holders have 90 days to report hours. You will not be able to earn hours during this time. But it gives you a few extra months to fill out the online forms. If you don’t report enough hours, your credential will expire. Therefore, educate yourself and renew before the due date.